For that test run, we created a short road trip route in our home state of Montana. 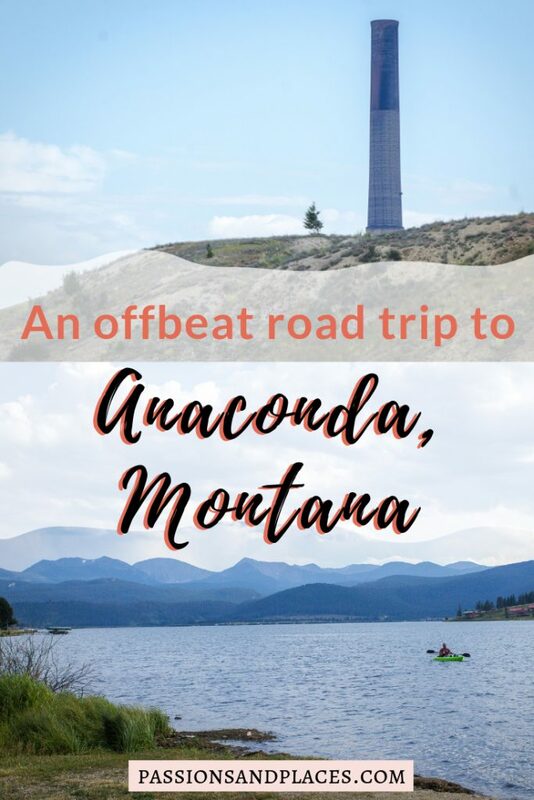 We wanted to hit up some of the more obvious places – like Glacier National Park, Whitefish, and Bozeman – but as we’d considered this trip over the preceding months, I had made a point that we had to visit Anaconda. Unless you’re from Montana or know a lot about 19th-century mining in America, you’re probably not familiar with Anaconda. It’s Montana’s ninth-largest town (which isn’t saying much) and is mostly known for having a giant smokestack. I’m often shocked by how little we know about places that are just a short drive away, as if we’ve already written them off as having nothing worth seeing. Anaconda is only a couple hours from our hometown, yet we’d never done anything more there than stop for gas en route to the nearby Pintler Wilderness. Seeing the sorts of places that aren’t at the top of the TripAdvisor page is one of the main reasons we decided to take this road trip. If you ask us, almost every town has something fascinating to be discovered. 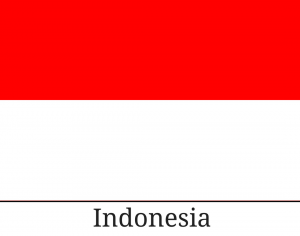 It’s why I scour websites like Atlas Obscura, trying to find the weirdest things in the most out-of-the-way places. Anaconda’s colorful and oft-forgotten history seemed like exactly the sort of place we should be exploring. Not surprisingly, Anaconda doesn’t have a ton of lodging options, and it was particularly lacking when it came to our go-to accommodation: Airbnb. The handful of very basic chain hotels seemed kind of lame and overpriced, and the actual bed and breakfasts were a bit out of our budget. One thing you can always find in Montana, though? Great places to camp! We pitched a tent for three nights at Lost Creek State Park, which is about twenty minutes outside of Anaconda. In our time there, we only saw a few other campers occupying the two dozen or so campsites (and this was on a weekend in August). Lost Creek is a great example of how state parks can be wonderful and more sustainable alternatives to crowded national parks. It’s peaceful and beautiful, with thousand-foot-high granite walls and a waterfall that plunges over a fifty-foot cliff. 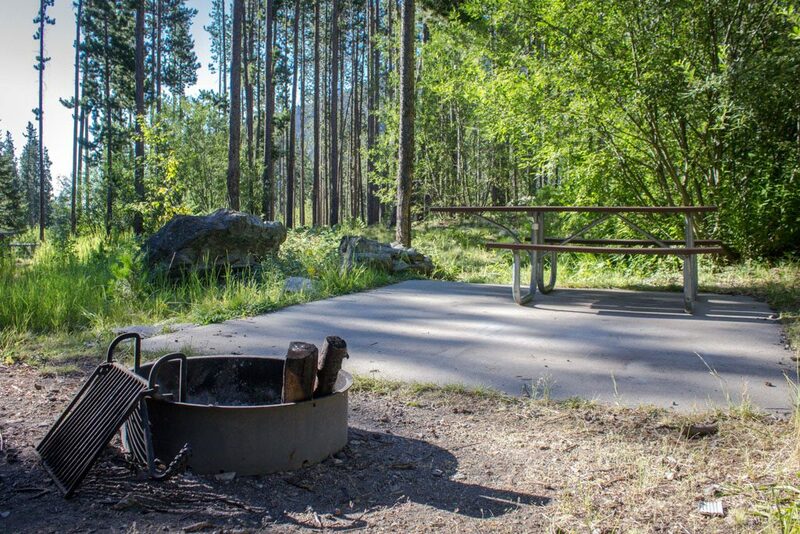 Unlike many of the nearby national forests, though, camping in the park isn’t free (it’s $18/night for Montana residents and $28 for non-residents). But it did have a vault toilet, picnic table, fire ring, and water spigot, and we appreciated the amenities. 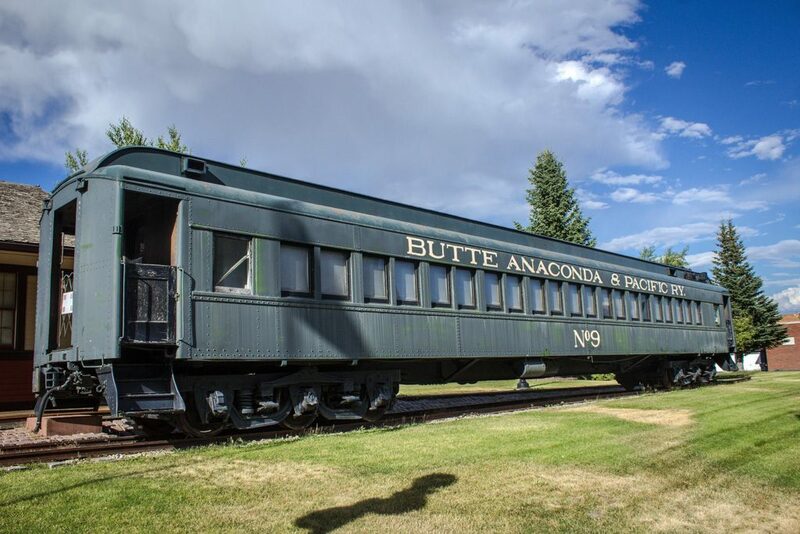 Our first stop in Anaconda was an unexpected one. Jen desperately needed someplace with a Wi-Fi connection to finalize an article she was working on. Not surprisingly, this little town has exactly zero Starbucks locations, so we were scrambling to find an alternative. TripAdvisor and GoogleMaps had no solution, but fortunately, Yelp revealed a teahouse in the middle of town: Misty Mountain Teas. 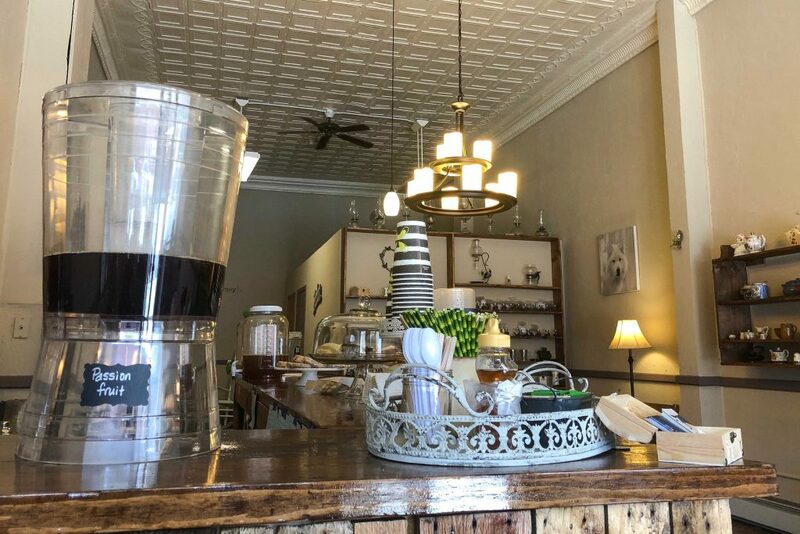 Anaconda is known for being a gritty mining town, a place for tough guys, so we were more than a little surprised to find a cute teashop with lace tablecloths and flowery cups. But not only did they have a massive selection of tea bags to choose from, they were also brewing up a couple of specialty teas: Indian chai and hibiscus. Their freshly baked pastries were also a nice treat after a few hours on the road. Misty Mountain ended up being a great place to get some work done before settling into our camping routine for the next few days. The Wi-Fi worked great, and it was extremely quiet since we were the only customers. The owners told us they’d just opened a few weeks prior (good on whoever added them to Yelp so quickly!). They were incredibly friendly and really passionate about bringing gourmet teas to Anaconda. 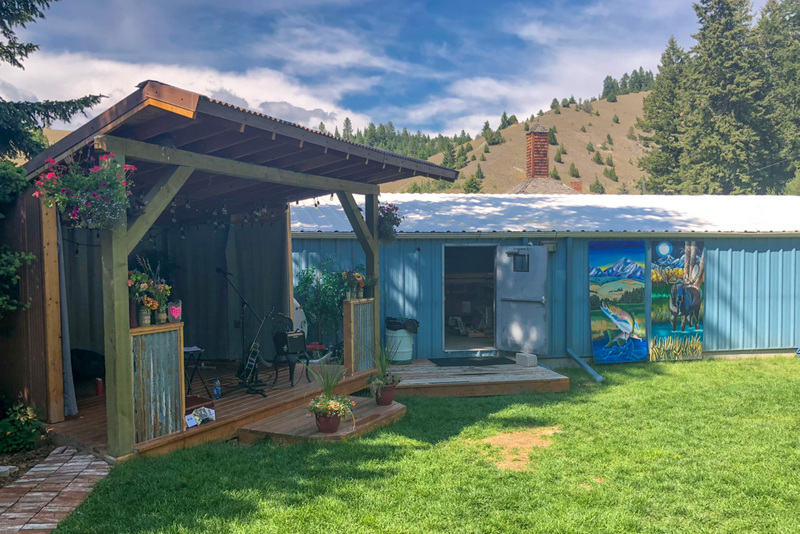 This is exactly the type of small business we love to support, and we’re looking forward to going back during our next visit to Montana to see how it’s doing. The most striking feature in Anaconda is undoubtedly its famed smoke stack, a 550-foot-tall brick chimney built in the early-20th century as part of a much larger smelter to process copper. 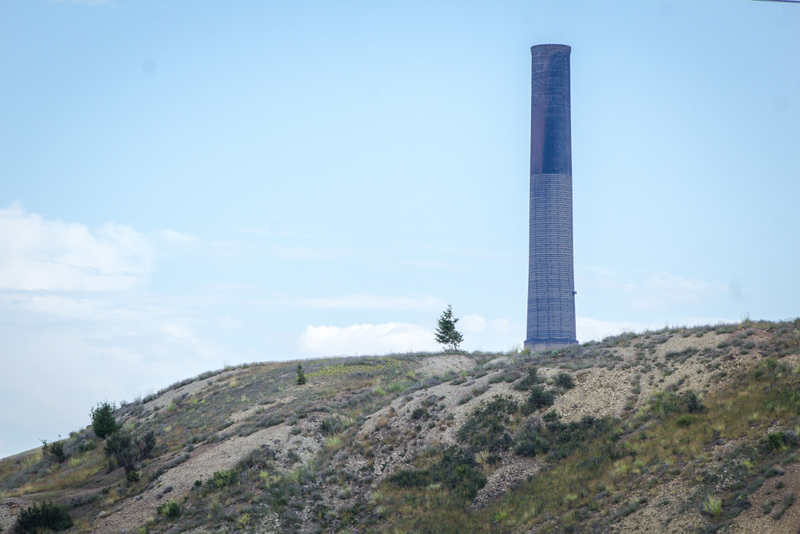 The smelter was decommissioned in the 1980s, and everything but the smoke stack was torn down. Today, the Anaconda Smelter Stack’s claim to fame is that it’s the tallest masonry structure in the world (the Washington Monument would handily fit inside of it). Since we were in Anaconda, we obviously had to go visit the stack. Except you can’t visit it – because the surrounding grounds are a Superfund site polluted with arsenic, lead, and cadmium. The closest you can get is the viewing platform at Anaconda Smoke Stack State Park, over a mile away. Designating this as a state park feels like a stretch, being as it’s less than an acre in size and consists of no more than a concrete platform with some signs and sculptures. From so far away, the stack doesn’t even look that big. However, the viewing platform is designed to be the same width as the stack, which does give a sense of its enormity. The best thing about visiting small towns and offbeat places is finding the unexpected. 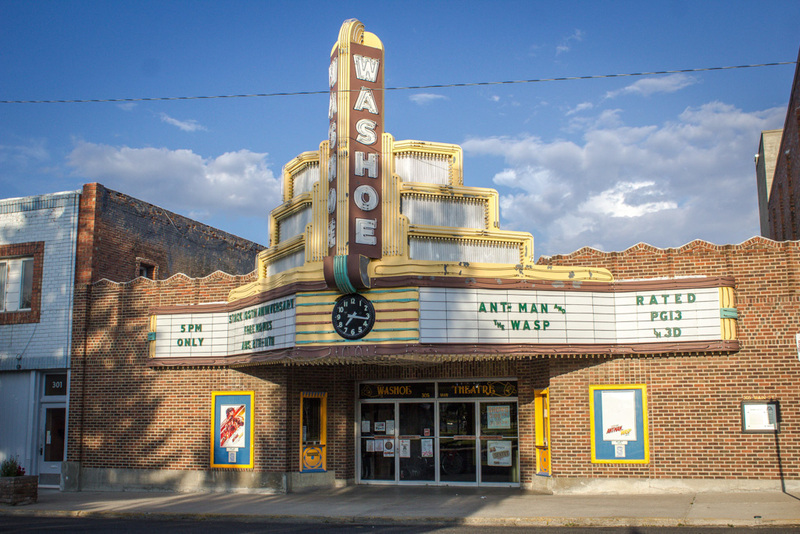 In searching for oddities around Anaconda, I came across the Washoe Theater, an Art Deco-style building straight out of the 1930s. It bears no resemblance to a Carmike or AMC, and looks more like an auditorium where you’d see a stage play. 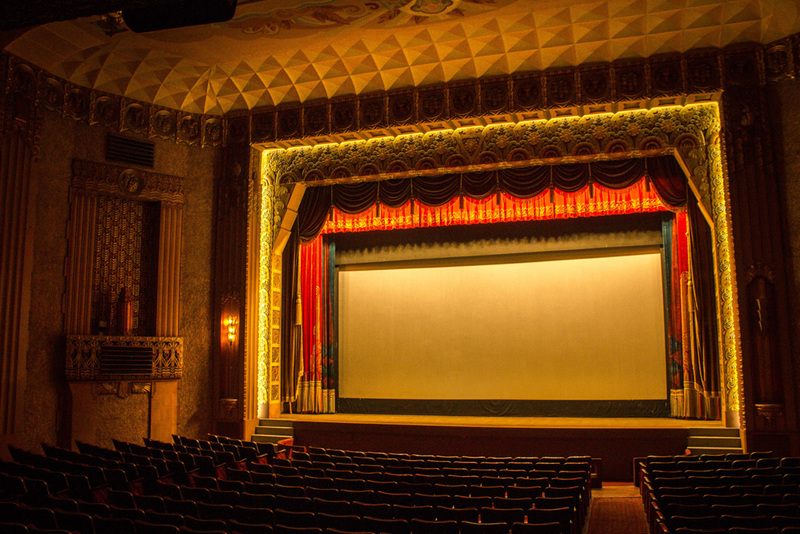 The theater has a single screen and shows movies for just a week at a time. Showings are only listed on their Facebook page and the giant marquee outside. And buying tickets on Fandango? Forget about it. The credit card machine wasn’t even working when we were there. The experience of watching a movie in such a historic theater is worth the $5 ticket (plus $0.50 extra if you want to sit in the balcony), even if you don’t care for what’s playing. We saw Ant Man and the Wasp, and like all the other Marvel superhero movies, it was ridiculously cheesy. But I’d be lying if I didn’t feel a little bit classy watching it at the Washoe. One of the things I love about our home state is the multitude of great craft breweries to visit. 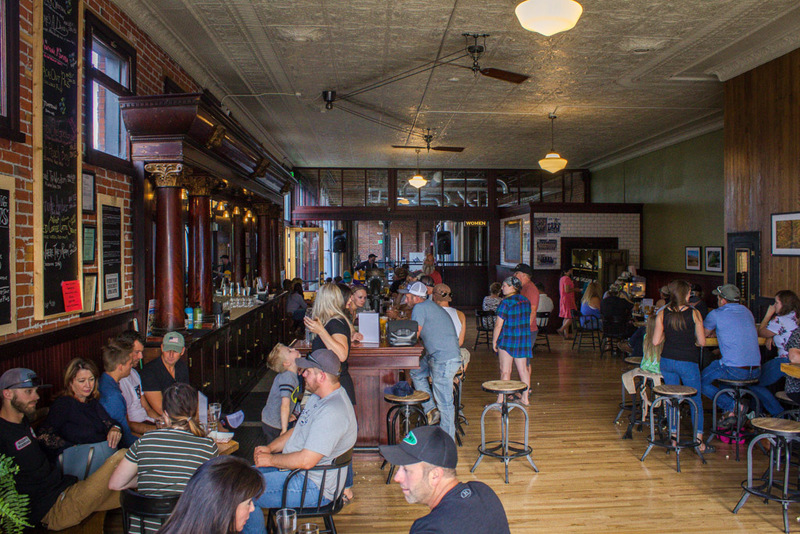 Just about any town in Montana with more than a thousand people has its own brewery these days – this is only a slight exaggeration as it’s now the #2 state for microbreweries per capita. Smelter City Brewing is Anaconda’s local pub and appeared to be the place to go on a Friday night. We stepped in to find a lively crowd enjoying a pretty decent band playing 90s covers, which Jen was very pleased by. I was more impressed with the beautifully restored building and wide variety of beers on tap, some of which were pretty experimental. We also enjoyed the free popcorn, which is a mainstay at Montana breweries due to the inscrutable laws governing the sale of food at breweries. When we got up to look for the bathroom between sets, we realized the brewery was attached to a small art gallery… populated with some rather creepy dolls. There’s always something interesting to find on a road trip. Besides the infamous smoke stack, O’bella Italian restaurant might be the best-known thing in Anaconda. Touted as one of the only “real” Italian restaurants in Montana and boasting a menu filled with mouth-watering dishes like black truffle mac & cheese and wood-fired pizzas dressed in artichokes, feta, and fresh tomatoes, how could we not eat there? Unfortunately, we didn’t get the chance to, having completely underestimated its popularity. Stopping in on a weekday evening just to see what it looked like, we were promptly asked if we had a reservation (I mean, this is small-town Montana, we wouldn’t even have thought they took reservations). We said no and asked if there was an opening the next day, but were informed the next availability was over a week out. Live and learn, but don’t underestimate the draw of great Italian food in a small town. Our second-choice option for dinner in Anaconda was a pizza shop called Gallicano’s, which conveniently offers their pies by the slice. Sadly, when we arrived, they had just one homely looking slice of cheese and some garlic knots, which left us debating the merits of ordering a whole pie (which are only available in a monster 18-inch size). Then one of the employees told us they were out of dough and wouldn’t be making any more pizzas that night. Resigned to PB&Js, we sulked for a few minutes on a bench outside before realizing we should at least get the garlic knots. When I went back in to order them, the girl behind the counter told me I could just have them and the slice of pizza for free since it’d get thrown out otherwise – a road trip miracle! We thoroughly enjoyed our greasy substitute for O’bella on the bench, and then headed back to the campsite to make some s’mores. After a restful night of sleep in the tent, we headed out on a day trip to Granite Ghost Town, an hour away. The drive there is an attraction in itself, as Highway 1 weaves its way through the stunningly beautiful Pintler Range of the Continental Divide and down into Flint Creek Canyon. Many tourists come to the area just to drive this 64-mile stretch of highway, but it’s also popular with hikers trekking into the Pintler Wilderness, one of Montana’s wildest and least crowded wilderness areas. Although we both grew up surrounded by the beauty of our state’s rugged peaks, places like this never fail to leave us in awe. 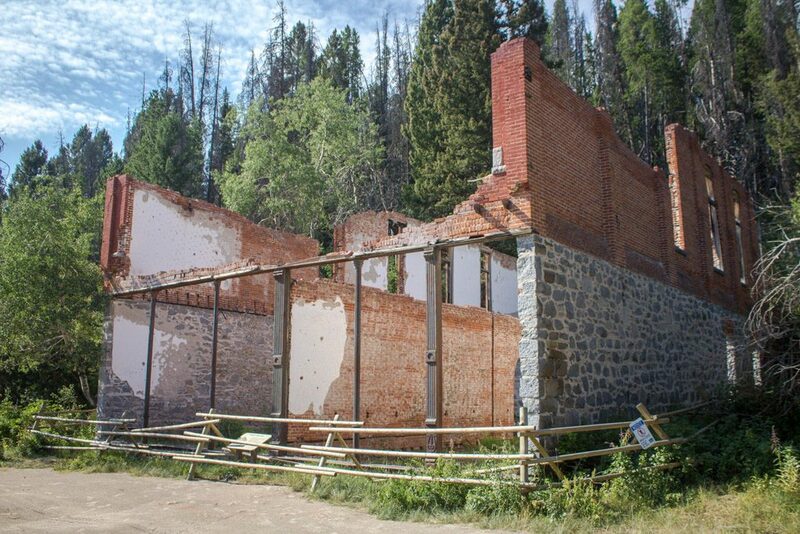 As you might guess from some of our past posts, we love to visit ghost towns and explore abandoned places. There’s something fascinating about seeing what happens when a place that was once so important is left to the destructive forces of time. It’s amazing to see how quickly nature reclaims these places when humans are no longer there to tend them. Granite Ghost Town was one of the main reasons I wanted to come to the Anaconda area. 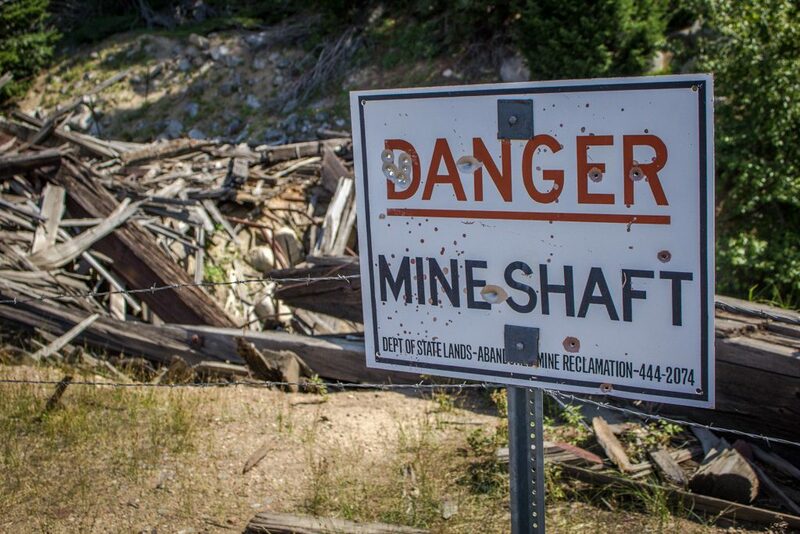 This abandoned community has remained untouched since it was officially vacated in the late 1960s and hasn’t been developed for tourists like some of Montana’s other historic cities. 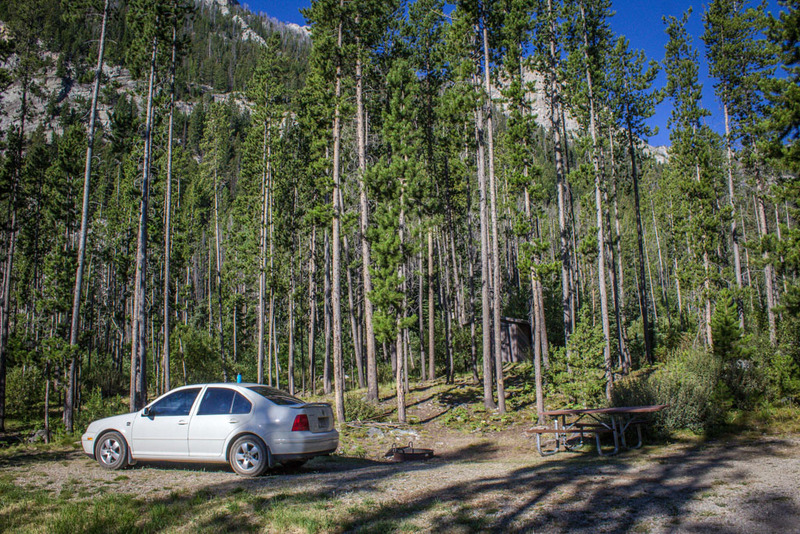 Granite is located on top of a mountain and we began the adventure with the Jetta creeping up a very pitted dirt road. It must haven taken about twenty minutes to go just a few miles, and the road would be impassable with a small car after a rainstorm. 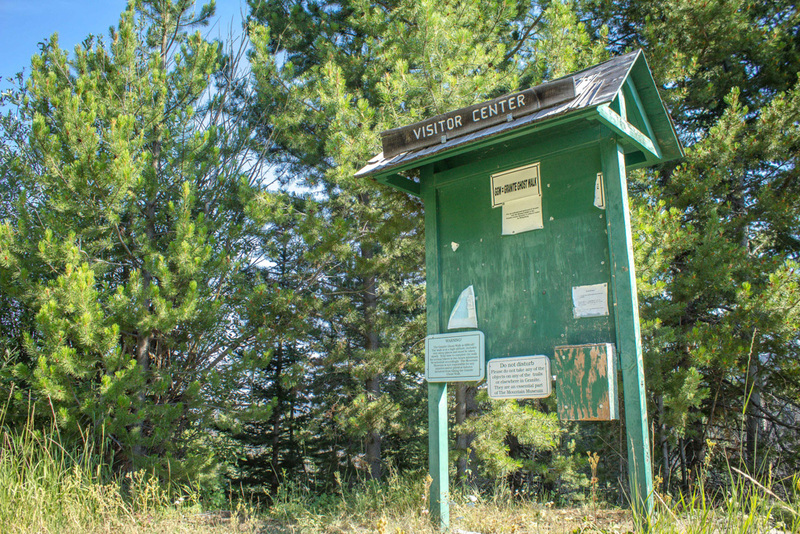 Once we reached the summit and got out of the Jetta, we found a couple small signs indicating it was a state park, but not much information on where to go. A few little posts say GGW (Granite Ghost Town Walk), but they didn’t really seem to form a route, so we just strolled around searching for abandoned buildings. We came upon a few, including the Union Hall, where most of the town’s functions happened, and a home that belonged to its final resident (now occupied by a rather irritated deer). What I was most curious about was the mine that turned Granite into a boomtown, which despite being huge, was not immediately obvious. Nearly ready to give up, we decided to hike another ten minutes in the opposite direction, and finally stumbled upon the massive ruins of the 19th-century silver mine – a set of stone terraces leading up to its shaft. I got a little carried away from my photography venture and lost Jen, which left her wondering if I’d fallen down the shaft in my quest to get the perfect shot. To say that Granite isn’t as touristy as some of Montana’s other ghost towns would be an understatement. In the two or three hours that we were walking around, we saw just one other family there. 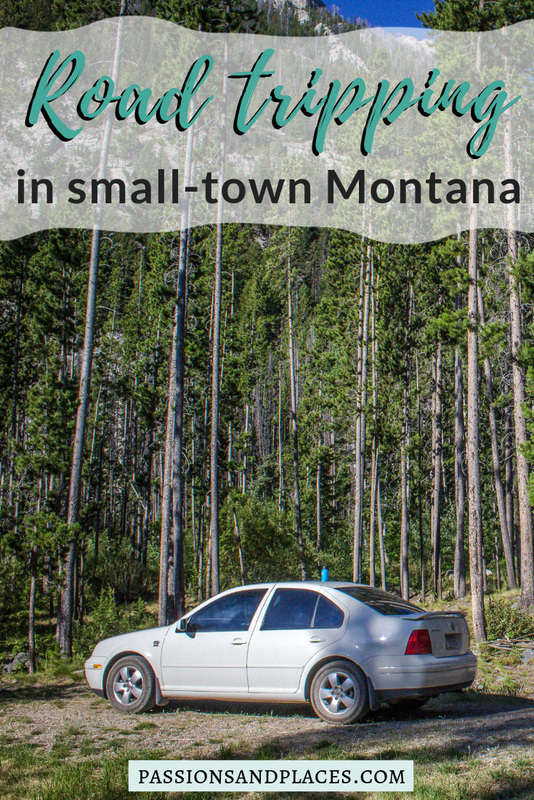 After eating some sandwiches at a picnic table near the parking area, we headed back down to explore another small Montana town: Philipsburg. Philipsburg, like Anaconda, was built around mining, but when the mines closed in the 80s, Philipsburg was able to transition into a popular tourist destination. During the summer, carloads of tourists from Missoula make the 90-minute drive to wander the historic town’s picturesque streets. It’s tiny: you can walk across the whole town in about fifteen minutes, not including the time spent ducking into little cafes and shops. The Philipsburg Brewing Company has made a name for itself over the last few years, as their cans have been getting distributed throughout the state. Nothing beats drinking at the source, though, so one of the first things we did after parking in downtown Philipsburg was march up the hill to the brewery’s secondary location (the main taproom is in the center of town). This offshoot, known as the Springs, is only open during the summer and is less of a taproom and more of a backyard party space. Folding chairs are set up on the lawn outside the brewery, and there’s even a stage for live music. We didn’t even know there was going to be a performance that evening and showed up a bit too early. 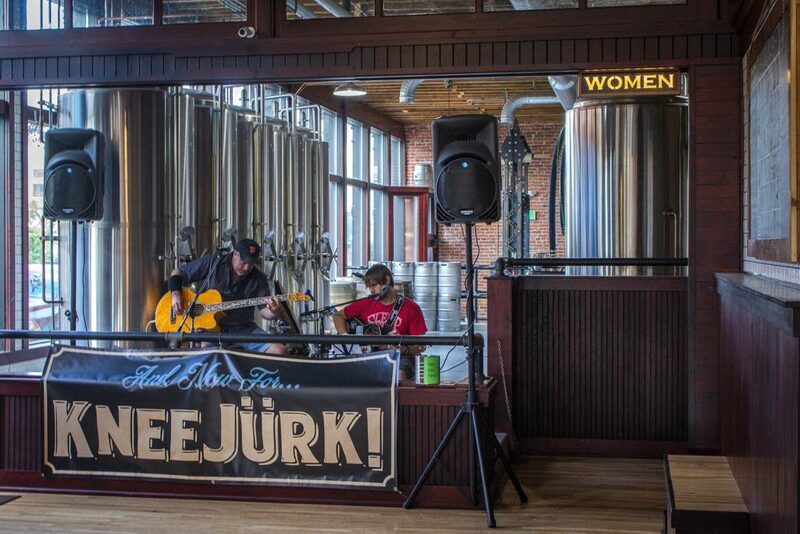 So we just sipped our delicious brews and watched the musician do her sound check. What we heard sounded great, so we were disappointed to miss her actual set. If we’re ever back in Philipsburg during the summer, though, this will be our hangout. Go to any small town and you’ll likely find something calling itself “The World’s Largest ___” (or tallest or best or some other superlative). But it’s usually a disappointment, either because the claim is dubious or because it’s something that never needed to be the largest (looking at you Baker, CA, and your 134-foot-tall thermometer). 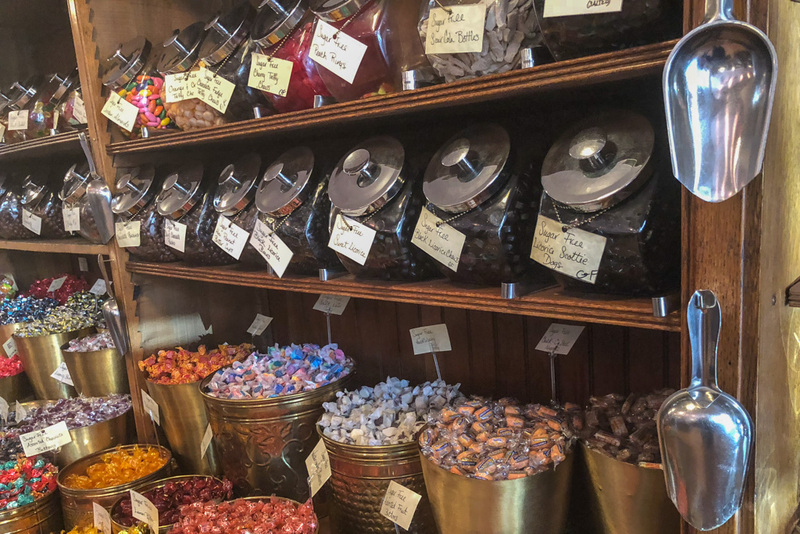 To be fair, I’m not sure how I’d determine whether the Sweet Palace in Philipsburg is truly “The World’s Greatest Candy Store” as it claims. But one look inside – and one sniff of the intoxicating chocolate and sugary aroma – is enough to know it’s definitely a contender. Every kind of fudge, jellybean, and chocolate is available in this two-story tribute to sugary treats. It was nearly impossible to choose from the rows and rows of sweet-smelling candy, but we eventually settled on an assortment of taffies and mixed chocolate delicacies. I’m not ashamed to say it, we ate half of it that night. 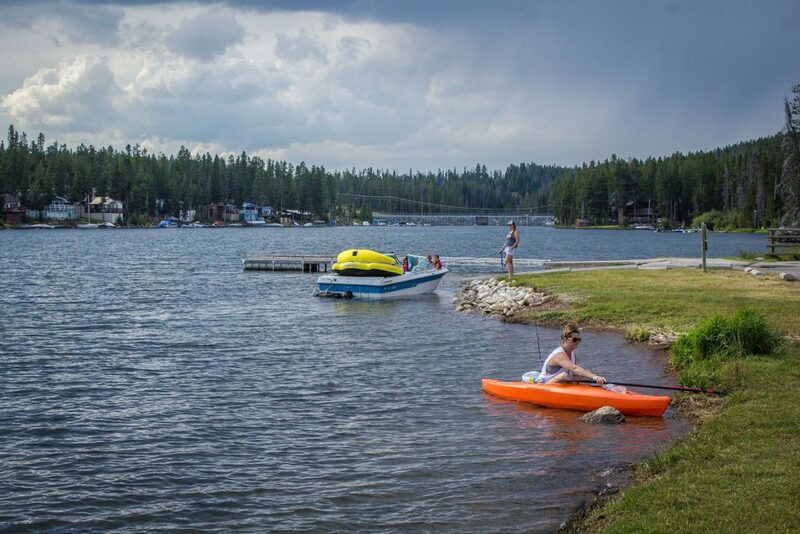 Since we didn’t leave Philipsburg until pretty late in the evening, we unfortunately didn’t have any time to spend at the amazing Georgetown Lake, halfway between it and Anaconda. If we’d had another day, we would’ve loved to spend an afternoon lounging on its shores, swimming in the cool waters, and even kayaking. I devoted half of the VW’s tiny trunk space to my folding kayak, and paddling this alpine lake would’ve been a perfect opportunity to break it out (and justify it accompanying us). Anaconda is definitely off the beaten path. Most visitors to Montana hit the national parks, Bozeman, Whitefish, or maybe Missoula, and that’s often it. 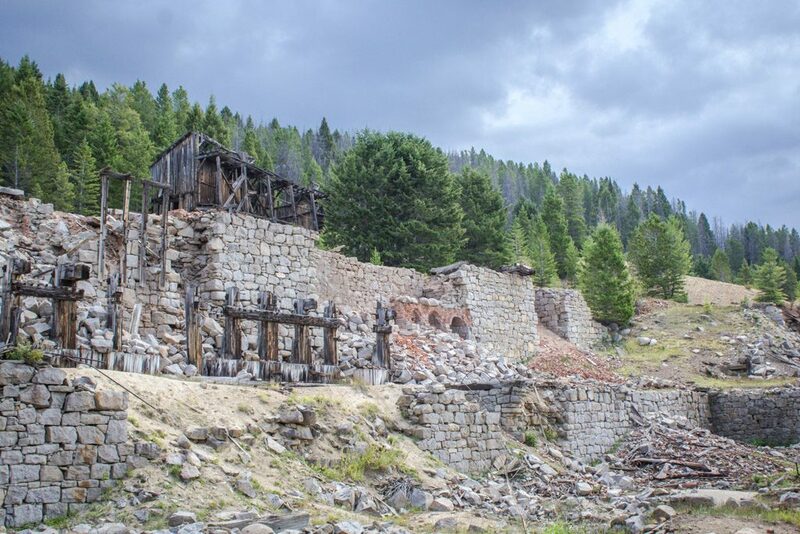 No one would accidentally stumble upon this old mining town. That’s the whole point, though – Montana has so much to discover beyond what’s in the tourist brochures. If you like visiting offbeat places and wandering around small towns, you’ll love exploring the Anaconda area as much as we did. Bonus: if you visit in the winter, you can head up to Discovery Ski Area. It’s just half an hour from town and is one of my favorite ski areas in the state! 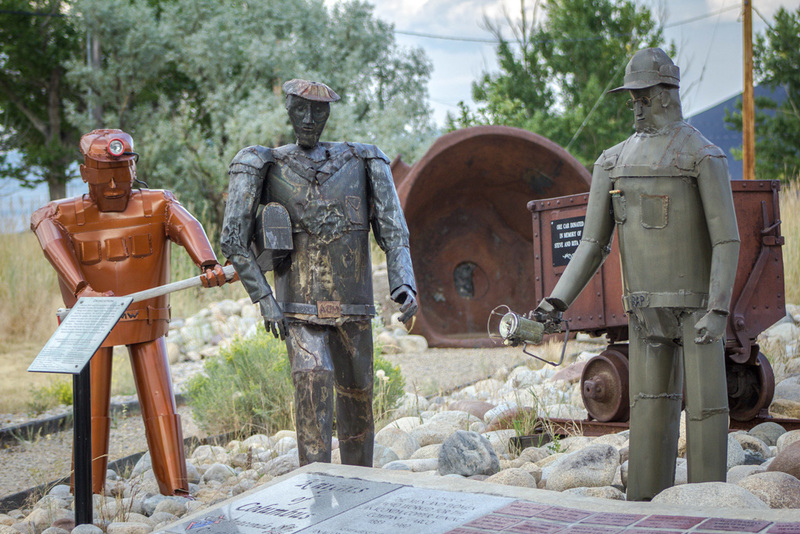 Do you have a favorite offbeat town in Montana? Let us know in the comments! 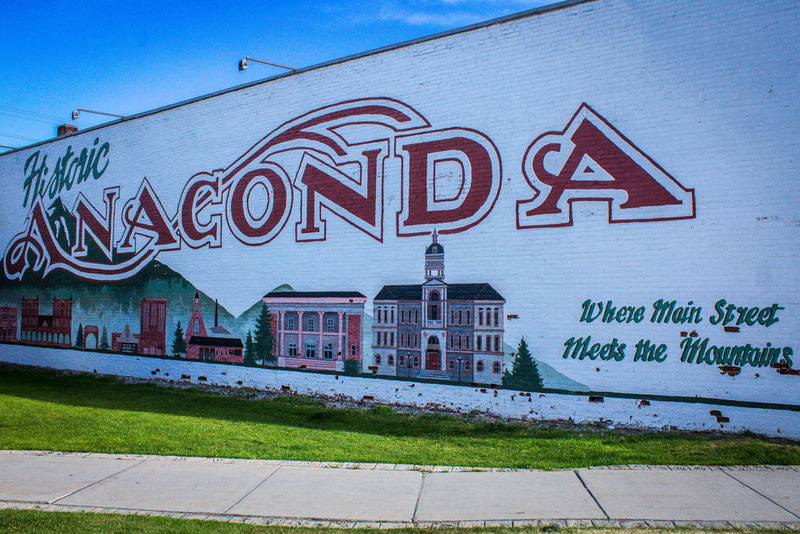 I love the name Anaconda for a town! I’ve never been to Montana….yet. Looks very cool and pretty. I need to go to that tea shop!!! Fun Fact: the town’s founder wanted to call it Copperopolis. It was turned down, not because it was a silly name, but because there was already a town that was called that. Montana is amazing though, and this is just one of the many interesting towns in it! YESSS!! THANK YOU FOR FINALLY GIVING ME THE AMMO NEEDED TO CONVINCE MY BF THAT MONTANA IS SUPER COOL!! Gonna show this to him right now! So glad we could help! If you need more ammo, check out our posts on Montana’s national parks, Bozeman and Missoula (our two favorite towns), Elkhorn ghost town, and our hometown of Great Falls in the Montana section of our destinations tab. There’s always one more reason to visit Montana!